Get your fixies, 10-speeds, and mountain bikes primed and ready. Heck, if you’re rocking the Pennyfarthing, bring that, too! We’re officially counting down the days until the 9th Annual Cranksgiving extravaganza. Every year, St. Louis BWorks pairs with Schlafly for a family-friendly bike ride and canned food drive that benefits Food Outreach. We’re thrilled this year to share that TOKY’s print designer, Ashford, created the featured event poster design. With the idea to mash up everything Thanksgiving and bicycle related, Ashford came up with a fun and unique design. Look twice, that’s no ordinary bird. Featuring a turkey made of bike parts, the design incorporates both the theme of the event and the ethos of St. Louis BWorks, the poster has a fun, handmade feel as well as offering a fresh twist on traditional holiday iconography. 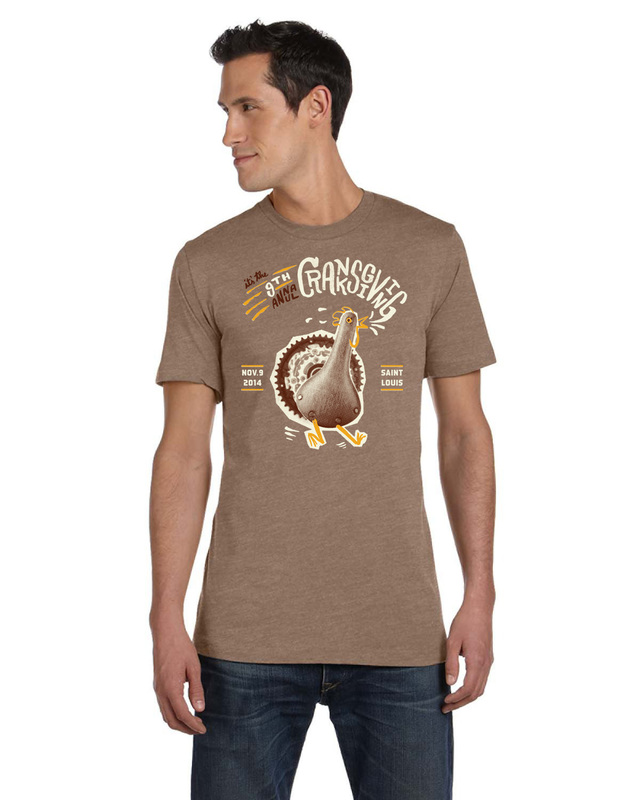 The gear-turkey is also being featured on event tees. What’s a race without a commemorative tee, right? Save the date for November 9. Brush off the bike helmet and attach an adorable little bike bell to your handlebars. You can get the full details at BWork’s Cranksgiving page.